Bob Marley’s early and some say finest work. corner of East street and Tower street before moving to it’s present address in 1961.
increasingly harder to obtain, the logical step seemed to be to branch out into Production. on it’s opening, Producer/Manager Danny Sims booked it out for two months solid. 1. NATTY INNA BABYLON DUB. won’t Get a Witness’, over the classic Bangarang Rhythm. 2. JAH JAH’S DUB CHILDREN. the classic dancehall rhythm ‘Freedom Blues’ also known as ‘MPLA’. 3. DUB BROKE MY HEART. A lost dub to Delroy Wilson’s ‘Any Heart can be Broken’. Cornell Campbell’s ‘My Confession’ features on this lost till now dub. 5. HIGH ON A THING CALLED DUB. A horn cut to Tommy McCook and the Aggrovator’s version of ‘Springtime’ Nice!! A dub to Ernest Wilson’s big late 60’s hit ‘Sentimental Man’. 7. CAN’T GET DUB OUT. Cornell Campbell’s ‘Can’t Get me Out ‘ features on this lost till now dub. 8. AT THE TURNING POINT OF DUB. Again Cornell Campbell’s dubbed vocal features over this version to Slim Smith’s ‘Turning Point’. 9. I NEED SOME DUB. Cornell Campbell worked the ‘2 Bad Bull’ rhythm for his cut called ‘Need to Belong’ this is a lost till now dub cut. 10. A LAID BACK DUB TUNE. A lost dub version to Byron Lee & the Dragonnaires ‘Way Back Home’. 11. GROOVING OUT ON DUB. An unreleased Johnny Clarke dub to Hopeton Lewis’s ‘Grooving out of Life’. A Lost till now cut to David Issac’s ‘Gift of Love’. Nice !!! 1. CAN’T GET DUB OUT. 2. AT THE TURNING POINT OF DUB. 3. I NEED SOME DUB. 4. A LAID BACK DUB TUNE. 5. GROOVING OUT ON DUB. 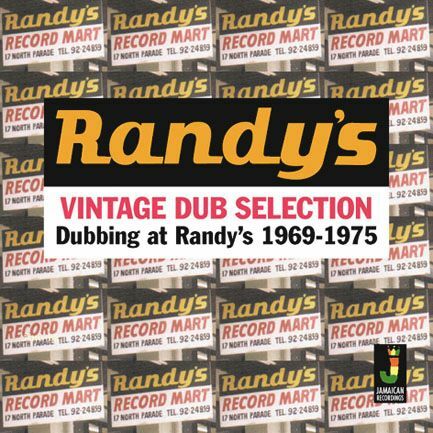 Recorded at: Randy’s Studio 17, North Parade, Kingston. Photography: Bunny Lee, Jah Floyd Archive.